This past summer, just before school started back up, I got my Private Pilot License. Basically this means that, according to the Federal Aviation Administration — a bunch of guys in suits who only laugh according to official regulations and who are tasked with regulating everything that goes up into the sky that doesn’t migrate south for the winter — I am now legally able to take passengers! Now I can subject normal people — not just professional flight instructors who’ve never been so happy to get back on solid ground — to a ride with me at the controls. Learning to fly in my early 30s has been a lot harder than learning to drive when I was 17. You see, when most of us learn to drive, we’ve already ridden in a car for thousands and thousands of hours, many of them spent having a say in the process, or at least trying to. We tried to influence speed (“Can’t we go any faster?”), length of the trip (“Are we there yet?”), and even navigation (“Do we have to go to church? Can’t we go to Dunkin’ Donuts instead?”) If we were really precocious, we might even have snuck in some actual practice. When he was a kid, my uncle used to wait until my grandparents went out for the evening and then take the family car for a spin. He’d dress up in my grandfather’s coat and hat too, to avoid suspicion. By the time he took his driver’s test, you have to imagine my uncle was really well prepared — partly because of all the practice, and partly because he was grounded for so long that he was 27 years old by then. The point is that, for most of us, by the time we’ve reached that sweet spot of raging hormones, lack of respect for authority, and inability to reflect on our actions that the U.S. government has declared is the perfect time to give us control of a two-ton speeding object — we’ve already spent half of our waking lives in a car. Or, if both sets of grandparents live within striking distance, more than half. We’re ready to drive. Learning to fly, on the other hand, was much stranger. I’d flown on commercial jets as much as the next person. I’d done some fantastic loops around the U.S. just to get to places I probably could’ve hitchhiked to more easily, and with more legroom. I once had a pleasant flight from Boise, Idaho back home to Baltimore, except that I believe I was routed through somewhere like Burma. I’d spent my fair share of time in planes. But I wasn’t gaining relevant flying experience. I was just sort of sitting there back in coach like everyone else: trying to keep snoring weirdos from drooling on my shoulder, eating nondigestible food, and pondering “Cat Fancy” or whatever was in the seat pocket. I wasn’t watching the pilots do their thing. The only people I’d ever watched fly an airplane were named “Goose” and “Maverick.” My first flying lesson, when I was 31, was my first time in the cockpit. So if being given the wheel of a car felt like a long-overdue promotion, being given the control stick of an airplane felt like being handed a scalpel and shoved into a room marked “gall bladder surgery.” I was just completely at a loss. My instructors would bark things at me like, “Do a slip turn with dive breaks fully engaged!” and I’d just start grabbing stuff. The only relevant prior knowledge that I had was two years of hang gliding, which counts for about as much with professional pilots as being in a folk band. If you ever want to make your FAA-employed, buzz cut instructor cringe, tell him you were a hang glider pilot. It’s like telling your employer you went to a high school whose name included the words “juvenile center.” Basically I came to the table with nothing. How do you make a small fortune in aviation? Start with a large one! The answer is that professional pilots can be rather desperate people. I don’t mean “desperate” like they’ll trade flying lessons for Oxycontin money (this isn’t Rutland Airport). 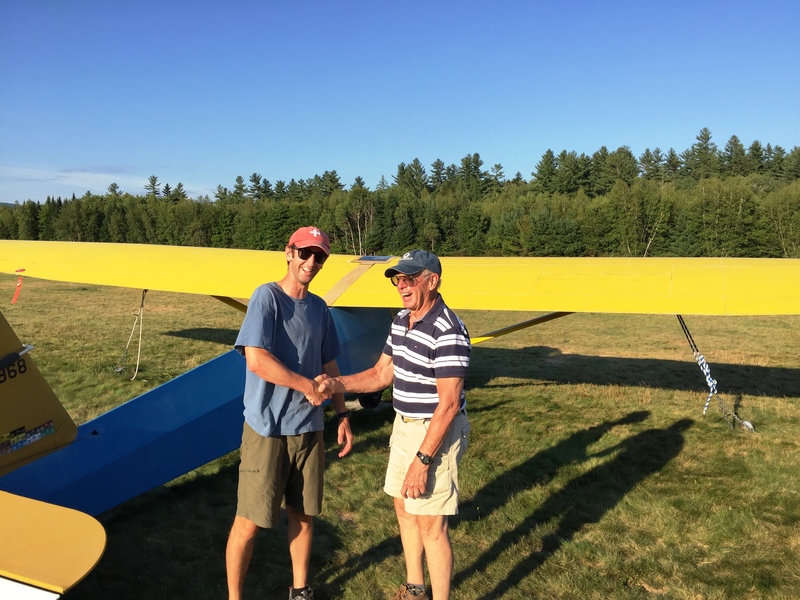 I mean that there aren’t many sports in which you can belong to a small glider club in the White Mountains with a flight shack that looks like the bunkhouse at a summer camp that’s going out of business and a runway that is basically some guy’s yard and still attract professional airline pilots, Air Force pilots, and FAA types to be your instructors. Why do such accomplished experts spend their weekends turning their hair gray while flying with duffers like me? The reason is simple: want to guess what professional pilots do in their spare time? Did you guess “flying”? Because it’s “flying.” And, by extension, for many of them, teaching flying. These guys who I’ve been lucky enough to have as my instructors genuinely love to fly on the weekends, even if that’s their job all during the week. Part of it is that we’re flying gliders at my club, which is sort of like flying a 737 passenger jet at work in the same way that riding a motorcycle is sort of like driving a city bus. Still, it’s always kind of amazing to me how much they love what they do. After all, I’m a teacher: when I get to the weekends there’s really nothing I’d rather do less than teach anybody anything. I want everyone to figure stuff out on their own. Everyone can open up their damn textbooks whenever the hell they feel like it. If no one wants to pay any attention to the person talking, be my guest. If you want to incessantly text your “bff” (or let’s face it, your mom), knock yourself out. By Friday night, all I want to do is set a bad example. (Though I don’t of course. I come home and water the flowers.) But maybe I’d feel differently if my job was flying through the sky. The fact is: I’ve been really, really lucky to have great instructors. That’s a large part of why I made it across the finish line at all. The answer is that I’ve been cannily working on my wife for about a year. I’ve been using lines such as, “much safer than riding in a car” and “definitely nothing like that ‘Sully’ movie that I stupidly took you to see.” We’ll see whether she’s game this year, or whether this might have to wait until I’ve accrued more marital capital. Either way, she did come to the airport on the day of my big test, when the whole club broke out the champagne for two of us who’d passed on the same day. One of my instructors snapped a photo of me shaking hands with my flight examiner. In the background is the plane I flew. Appropriately enough, it was one of the last days of summer before school started again: after months of studying, I’d finally passed.